If you are building a new home, or doing a remodel, there are things you can do to make your home more energy efficient. Here are some items to discuss with your contractor that can reduce the costs to heat and cool your home. 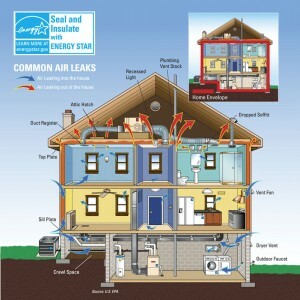 Air that moves through the envelope of your home wastes a lot of energy and increases your utility bills. So the first priority is to make sure that your home is properly insulated and sealed. Add insulation to the attic area to block heat loss in the winter. Don’t worry about finding and sealing all the little holes in your attic; your biggest savings will come from plugging the large ones. The areas where leakage is likely to be greatest: where walls (inner and outer) meet the attic floor, dropped soffits (dropped-ceiling areas), and behind or under attic kneewalls. You can ask your contractor to use additional insulation in the walls. 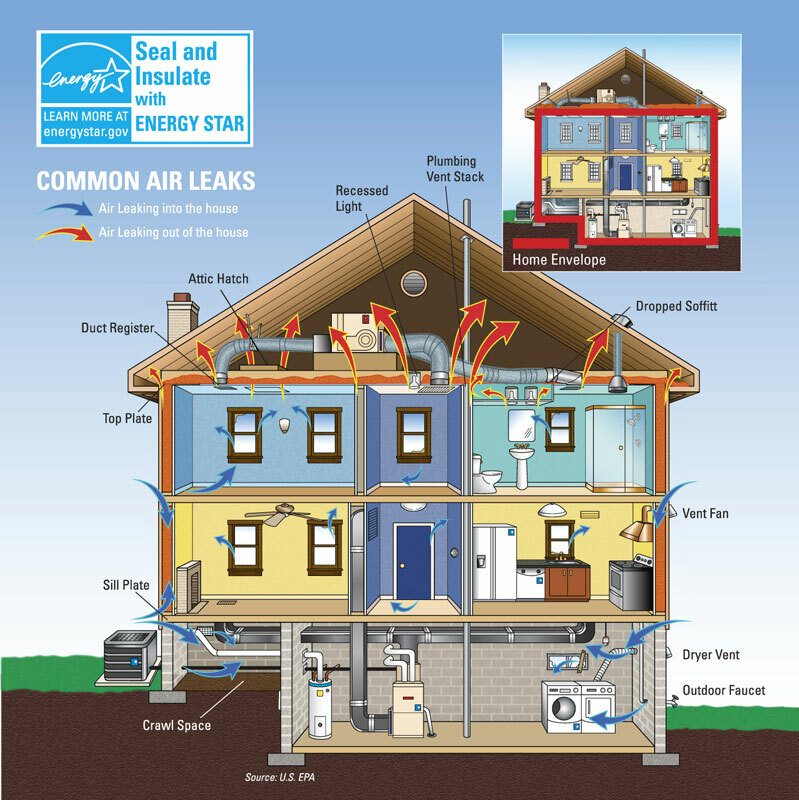 Sealing air leaks throughout the home will reduce drafts, improve comfort, improve humidity control and reduce pollen, dust and insects from entering your home. Your contractor may have special tools that can pinpoint hidden air leaks in your home, especially around windows, doors, ductwork, and switches. Your local utility may offer rebates for a professional home energy assessment and certain air sealing and insulation projects. Be sure to contact your utility company before beginning a project to see what incentives are available in your area. Check your home’s foundation to see if there are any areas that need to be sealed. Your basement or crawl space may need to be insulated if you experience cold floors in the winter; hot or cold ceilings, walls, or whole rooms; or uneven temperature between rooms. Second to the attic, the basement is one of the largest opportunities to save energy in your home. Look for common locations of air leaks in basements and crawlspaces, including between rim joists and under the sill plate, around windows, electrical conduits, pipes and vents that run up through the walls and the floor. Make sure your contractor uses low VOC caulking when sealing the leaks, to minimize the effect of harmful indoor gases. Sealing the home can trap indoor air pollutants such as carbon monoxide, radon and volatile organic compounds (VOCs) and create unsafe conditions. Properly addressing this may require additional ventilation fans to maintain safe air quality in your home or repairs to eliminate the sources of indoor air pollutants. If you are renovating your house, consider replacing windows with new, more energy efficient models. You can get double or tripled paned windows, argon gas-filled, and low-e coated glass. Each of these technologies may cost incrementally more at the beginning, but will save on energy costs over time. Check the “R-value” of each window type you are considering. The R-value is the measurement of thermal resistance—the higher the number, the more efficient the window. Your contractor can help you determine the cost-benefit of each window type. Replacing old aluminum window and door frames with vinyl can also reduce heat transfer. Weather stripping placed around windows and doors will also improve performance. Sealing your heating and cooling system duct work can not only save up to 20% of your heating and cooling costs, it also can improve indoor air quality. Sealing duct work gaps can help reduce asthma and allergy problems aggravated by particles entering the home’s air flow system. If you’re planning to install new heating and cooling equipment, a well-designed and sealed duct system may allow you to downsize to a smaller, less costly heating and cooling system that will provide better dehumidification. Cut back on your heating and cooling bills. Improve the comfort of your home. Welcome to the Weston Construction Blog. Here you can find information and photos about our latest construction projects in Charlottesville and Albemarle County. If you are looking for a builder for your custom home or renovation project, please give us a call for a consult and estimate. Call Todd Buck at (434) 531-8597. So You Want to Build an Addition? Weston Construction specializes in Custom Home Construction, Custom Renovations and Additions in Charlottesville and Albemarle County. Call us today to schedule a consultation for your upcoming project. Need an eco-friendly builder in Charlottesville or the Albemarle area? Weston Construction has the expertise to assist you with your Green Construction for a residential or commercial building.